US, 1996, 85 minutes, Colour. 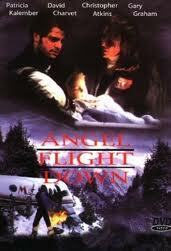 Angel Flight Down is a telemovie which the Americans do well. Bases on a true story, it focuses on Paramedics who fly people to hospitals in Colorado, especially during the winter. The plane crashes. There is a baby child on board and the staff and the father struggle to survive as well as to indicate to searchers where they are. The characters are the expected ones for this kind of action adventure. The incidents are also, in their way, predictable. However, it is not the predictability that matters, it is the audience seeing how human nature responds to crises and how they survive. 1. Interesting telemovie? Based on a true story? Incidents in newspapers almost every day? The story behind the headlines? 2. The mountain settings, the towns, the valleys, the mountains, the snow, isolation? Musical score? 3. The special effects, especially for the crash-landing? 4. The title, the angel flights for people in need? Their staff? The pilots and the air companies? The searchers? 5. The focus on John and his wife, his being a preacher with youth, their sick child, the wife's fear of flights, his going on the plane? The wife and her mother, travelling by car, the phone calls, the bad news, their waiting with hope? 6. Brett and Teresa, their work, their children, friendships, the company? Hoping to have the day off, birthdays etc? Their being requested to take the child? Clashes with family but their doing their duty? 7. Rick, his skill as a pilot, the engine going, his crash-landing on the side of the mountain, his concussion, delirium? His help? Return to flying? 8. Jack and his concern about the baby? The interactions with Brett about God and religion? His fear? The crash, their injuries? Coping? The cold, the darkness? To light a fire and its risk or not? The blankets? Being frozen in? Getting out of the plane? The baby and its need for the medicine? Keeping the baby warm? Clashes and Teresa challenging Brett about his macho attitude? Her own injuries and blurred eyesight? Their being together, supporting each other, being found? 10. The rescuers, their concern, the flights? The clues, the rescue? 11. The reconciliations, family love, health for the baby? The workers going back to work? 12. A film of compassionate ordinary values for ordinary Americans? Universal message about the generosity of human nature?